Sometimes the simplest products are actually great products. If you remember the good old days when people played tapes instead of CD’s, you would remember the Cassette boxes they came in. The idea was simple, use the box if you didn’t want to damage your cassette. These boxes weren’t the “be all, end all” for protection, but they did an adequate job of protecting your tapes from accidental splashes and dust. In addition to that, they made organizing your collection easy because they were uniformly shaped even though our cassettes were oddly shaped. Hard drives are no different. They should get the same kind of love and attention that our beloved cassette tapes did in the 80’s, but instead they are stacked on our shelves naked and lonely waiting for dust and coffee to find them. Fear not solution seekers, there is an answer! ineo (yes, that is a lowercase “i”) has produced a simple hard drive protection box, but does it cut the mustard… or the cheese? 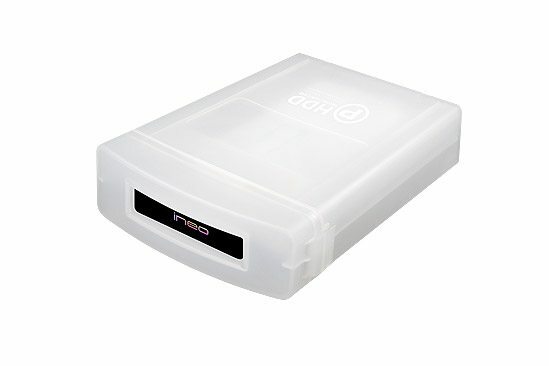 ineo took an idea from the past and made it viable again when they started producing their polypropylene hard drive protection box. 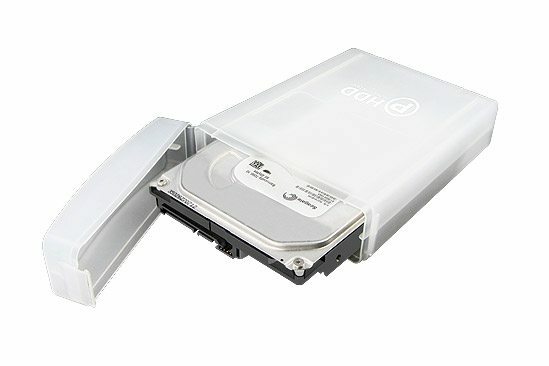 The idea behind it is simple; they created an enclosure for your hard drive that makes them stackable, splash resistant (not proof), dust free, and attractive. These boxes are intended for 3.5 inch hard drives that either needs to make their way onto a shelf or from one location to another. The protection box offers two sponges at both ends to assist you in keeping your hard drive safe by keeping it snug inside the box. The opening door is a bit hard to open, but that is what you want… you don’t want your drive just falling out while transporting. Accompanying the milky white polypropylene box is an ineo adhesive label and two blank labels. The ineo label features their logo and is affixed to the front of the box letting you know that they made it. The blank labels, however, are actually useful, they are designed to label what the HDD inside may contain along with the date. Overall, the $7.00 investment you may make on your HDD’s is worth it. The I-NC05 adds uniformity to stacking HDD’s and reduces your stress levels when you need to transport multiple drives on your back seat or in the rain (not a hurricane). The solid latch on the front keeps the HDD snug and ensures that it won’t hit the ground while walking. If you have a bunch of HDDs lying around like I do, then products like these make for a cleaner shelf and some peace of mind. Would I buy one? Actually, I am going to buy 10.